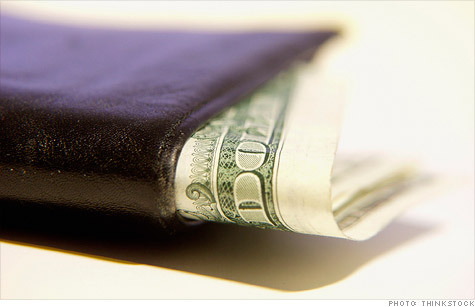 Fatter paychecks did not produce more spending by consumers in June. NEW YORK (CNNMoney) -- Consumers enjoyed a healthy increase in income in June, but that didn't get them to open their wallets, according to a government report released Tuesday. Income rose 0.5% from the prior month, according to the report from the Commerce Department, the best improvement in paychecks since March. Economists surveyed by Briefing.com had forecast a 0.4% rise. The rise in income means that incomes are now up 3.5% compared to June 2011, the best 12-month gain in income so far this year. It also was roughly twice the pace of increase in prices over the last year. But spending by consumers remained unchanged, and the May reading was revised to a 0.1% drop from being flat. Economists had expected a 0.1% increase in June. Controlling for inflation, spending actually fell 0.1% in the latest reading. Income and spending are both important to the nation's overall economic health. Spending by consumers makes up more than two-thirds of the nation's economic activity. While the increase in income is a good sign, the reluctance of consumers to spend could keep economic growth weaker than had been hoped. Other government readings on retail spending have shown a steady decline for the last several months, driven partly by the drop in gasoline prices, which has allowed consumers to hang onto more of their income. This report doesn't break down spending on gasoline specifically, but spending on energy overall fell 2.1% in this reading. But spending on durable goods, typically big ticket items like cars and appliances, also fell 0.1%, while spending on nondurable goods other than energy, such as food, was essentially unchanged. Only a 0.2% increase in spending on services prevented a drop in overall spending. While gas prices have started to rise again in recent weeks, that rise happened after this latest economic reading was taken. The combination of rising income and no spending growth helped to improve the nation's savings rate, lifting it to 4.4% from 4% in May. Joseph LaVorgna, chief U.S. economist for Deutsche Bank, said that the improved savings rate puts U.S. households in a good position to start spending again soon, since they have more cash relative to debt than at any time in the last 10 years. "We expect consumer spending to accelerate after what was an intra-second quarter slowdown," he wrote in a note to clients Tuesday.